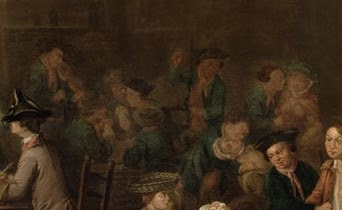 The Press Gang, John Collet, c.1760's, from The Foundling Museum. I was directed to this image by The 18th Century Material Cultural Resource Center. Among their many excellent slideshows are a few focused on naval material culture. Unfortunately, the Foundling Museum does not have a date for this piece. The 18th Century Material Culture Resource center gives this an approximate dating of c.1760's. Based on the clothing worn by men and women throughout this painting, I would agree with that approximation. 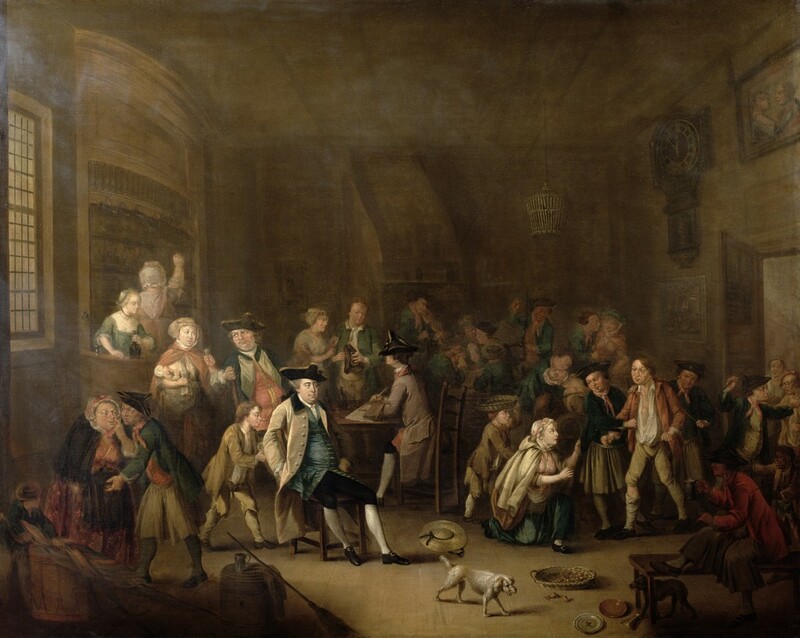 As with many tavern scenes of the time, this is a chaotic piece with a lot going on. 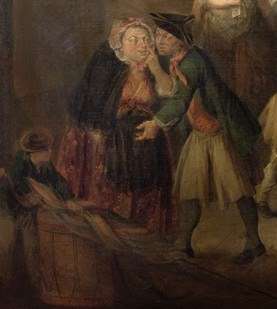 Starting at the far left is a tar sharing a word with a woman, possibly his wife. He gestures toward a boy who holds what appears to be a British flag. The sailor wears the familiar reversed cocked hat, perhaps with the brim bound in tape. The tar's blue jacket ends about the middle of the thigh, with slash cuffs. His neckcloth and waistcoat are both red, and his white petticoat trousers that end just below the knee. Gray stockings lead to round toe shoes, but the quality of this copy does not allow us to see the buckles. The boy also wears the dress of a sailor: a round hat with cylindrical crown bound in white tape, blue jacket, and plain white trousers. In the right of the frame, a pair of sailors drag a poor chap before woman on her knee, pleading for his release. 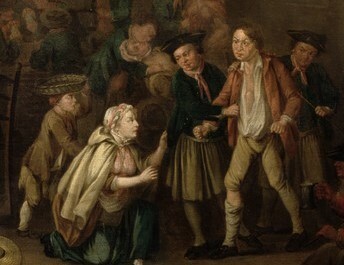 The jack on the left is wearing a cocked hat, red neckcloth, blue short jacket, petticoat trousers, and plain white or gray stockings. His mate on the right is wearing precisely the same slop clothes, though he might be holding a walking stick. 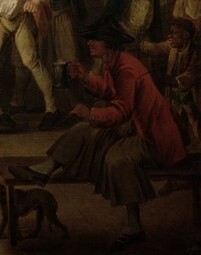 In the foreground at the right is a sailor lounging on a bench and lifting a lidded tankard. His cocked hat is turned with the point forward, and he wears a red jacket. The petticoat trousers hang long, but we can still see the gray or white stockings about his legs. In the background a mess of tars play cards and carouse with women. They wear cocked hats and cocked hats, and the bareheaded mariners on the right wear bob wigs. Though the image is faded, they appear to be wearing red neckcloths and waistcoats.